made by a single family Dairy in the hills of Emilia Romagna. Sweet and fruity with a rich savoury flavour. Made from raw cow's milk. Strength 6. 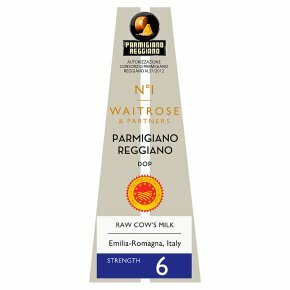 This Parmigiano Reggiano cheese is made everyday with milk from cows that graze on lush grass and hay harvested in the parmesan producing region of Italy. Selected from a single dairy each wheel of cheese is slowly matured to develop rich and rounded flavours.